Anthony Nehme is a trial attorney with extensive trial experience. He focuses his practice on personal injury, toxic torts, and DUI defense and has offices in Washington, D.C. and Los Angeles, CA. He has gained the reputation of being a fearless trial attorney who will work tirelessly and aggressively to achieve the best possible results for his clients. 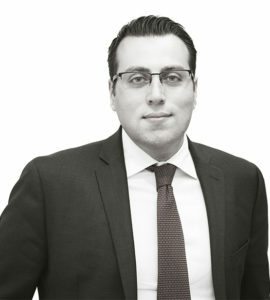 Anthony received his Juris Doctor degree from Chicago-Kent College of Law, where he focused his studies on criminal law, trial advocacy, and litigation. While in law school, Anthony was on the Dean’s Honor list and was an academic scholarship recipient. Anthony also received the highest grade in his class in Criminal Procedure, Torts, Torts II, Contracts, Contracts II, and Property. In addition, Anthony received a Master of Science degree in Forensic Toxicology from the University of Florida, where he focused his graduate research on forensic toxic interactions involving Selective Serotonin Reuptake Inhibitors (SSRIs). Anthony frequently consults with clients and other attorneys on toxicology related cases ranging from car accidents involving alcohol or drugs, chemical exposure to toxic substances, DUIs, to drug-drug interactions. Anthony has testified as an expert in Forensic Toxicology before the Superior Court of the State of California and the California Department of Motor Vehicles. In 2017, Anthony earned the American Chemical Society- Chemistry and Law (ACS-CHAL) Forensic Lawyer-Scientist designation, which is the highest form of scientific recognition available for lawyers. Anthony has certificates in Forensic Chromatography: Theory & Practice, Forensic Analysis of Solid Drugs, and Forensic Principles of DUID issued by Axion Labs and the American Chemical Society; and a certificate in Practical Gas Chromatography issued by Agilent Laboratories. Anthony is also a graduate of The Robert F. Borkenstein Course on Alcohol, and Highway Safety: Testing, Research and Litigation, at the University of Indiana. Prior to founding his law firm, Anthony externed with the Los Angeles District Attorney’s Office and the Los Angeles City Attorney’s Office, where he assisted in the prosecution of felony and misdemeanor cases in the City of Los Angeles. Anthony has also worked with other law firms on the defense of those accused of capital crimes, first-degree murders, bank robberies, and other violent felonies. Anthony is a member of the American Chemical Society, Chemical Toxicology Division, and Chemistry & the Law Division; Consumer Attorneys Association of Los Angeles; California DUI Lawyers Association; and the California Public Defenders Association.